You can book a variety of Tunisia crossings with SNCM or Grimaldi Lines (Grandi Navi Veloci) at AFerry.ie. AFerry.ie allows you to book Tunisia quickly in real-time and at the lowest price. For more information on the specific routes and crossings currently offered by AFerry.ie please visit the SNCM and Grimaldi Lines (Grandi Navi Veloci) pages. Tunisia's beautiful beaches and historical treasures attract millions of tourists from all over the world each year. Visitors sunbathe, dive, sail, and fish along the vast stretches of glistening, white sandy Mediterranean beaches covering a 810- mile coast. 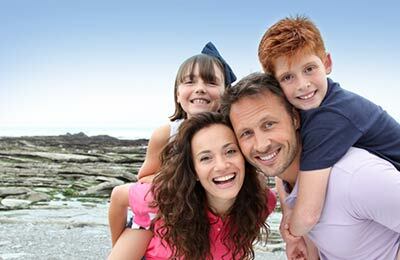 Beach resorts include Tabarka, Hammamet, Sousse and Jerba. If you're keen on Archeology, Tunisia hosts a wealth of Roman archaeological sites including the famous Carthage. There is also the second century Roman temple in Dougga, the Phoenician port of Utica, Sbeitla's Roman temples and arches, Bulla Regia's Roman villas and El Jem's Coliseum, which is second only to Rome. The Bardo Museum, near Tunis, boasts the largest collection of Roman mosaics in the world. Tunisia also has some incredible architecture including Masterpieces of Arab-Islamic architecture. 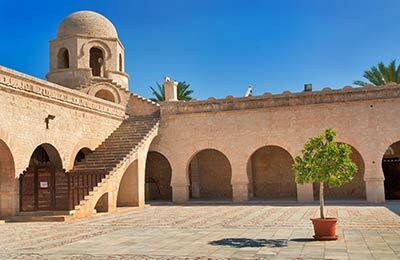 Among them: the Great Mosque of Kairouan, the Moslem World's fourth holiest city, and the Great Mosque of Ezzitouna, at the center of the old city (the Medina) of Tunis. 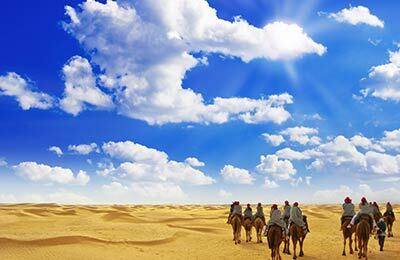 The great Tunisian south is home to lush oases and great Saharan landscapes . A special attraction is the unusual Matmata where the ground is pockmarked with craters (and where incidentally the Star Wars movie was filmed). Chott El Jerid, 2,000 sq. miles salt-flats as big as Kansas, offers mirages and sand-yachting activities. As with its landscape, Tunisia's climate offers a season for everyone's taste. Sailing, surfing, diving, golfing, exploring the archeological sites, deserts and oasis is a pleasure from October to May when the average temperature ranges from 12-28°C. Spring, March through May, brings spectacular displays of wild flowers throughout the countryside and Autumn, October to December, offer warm seas and a particularly golden sun. From June through September warm weather is the rule and August brings the peak of the summer heat. This is the season for the joy of refreshing a sun bronzed body in the cool sparkling Mediterranean.